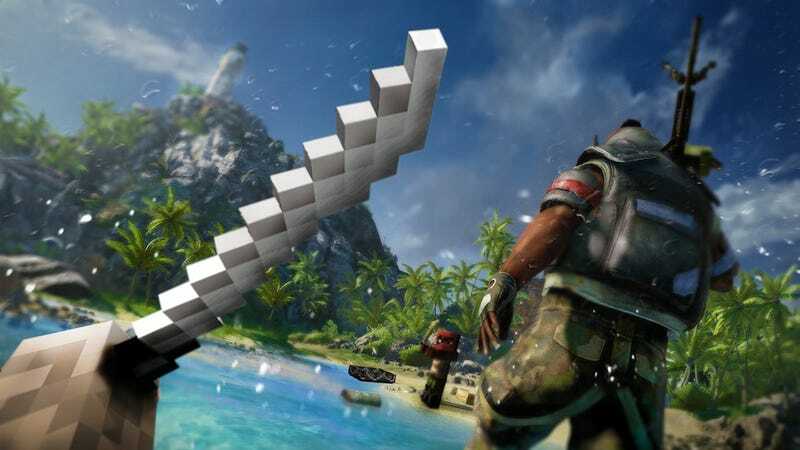 In a funny but cool-sounding crossover, the crazy world of Far Cry 3 will be arriving in Minecraft in a free PC download. On October 26, Ubisoft will be releasing a "Map and texture pack" for Minecraft that will open up a bunch of Far Cry 3 stuff in Minecraft. From their press release, the downloadable pack contains "modifications to all aspects of the original game, including environments, weapons and tools" and you will be able to "discover key Far Cry 3 locations and characters, including Vaas, Jason and Citra, all completely redesigned in Minecraft style. The map also features over 50 Easter Eggs, hidden throughout the Islands." Here's hoping that somewhere on Far Cry 3's island (in the actual game), there's a creeper waiting to be blown up. Between Borderlands 2 and Torchlight II, that'd be a hat-trick for Minecraft references just in the last few months.